The principal vehicle for the New Bible Code is the English-language NIV Bible (1984 Edition). Each Testament in this very special version is bookended by a pair of encodings, the four 'bookend encodings' succinctly encapsulating the message conveyed by the rest of the code. Before reading this page you may like to familiarise yourself with the code's two-part decoding system by reading either The Signature of Christ (short version) or Gematria in a Nutshell (long version). This is the two-part decoding system, unique to the New Bible Code. The first twelve words alone can be read as JESUS, therefore an alternative reading is JESUS and SECOND COMING side by side. The encoding of 'Jesus' is over twelve words, twelve being the biblical number of perfect government (the twelve disciples and twelve tribes of Israel). 'Second Coming' covers six words of text. The number six permeates the many encodings at this location, which is also significant, because man was created on the sixth day according to Genesis 1, which also concerns the six days of Creation. Six is the number of man, labour and sin. The return of Jesus, the last Adam, to redeem Creation is the work that undoes the sin of the first Adam. 'Jesus' Second Coming' is encoded over 18 (6 x 3) words and its standard value, 906, is the number of units in the outer ring of the Creation Snowflake, a six-sided snowflake also encoded here. 906 is 6 x 151, 151 being the ordinal value of 'Jesus Christ'. Remarkably, 604 is also a multiple, of 151, ordinal value of 'Jesus Christ', as it is 4 x 151. The sum of 906 and 604, the two Old Testament 'bookends', is therefore 1510, or 10 x 151. Note that this time the encoding is over fourteen words. This number might seem arbitrary, but its meaning is made clear in the next encoding, which is contained within the NIV Bible’s next fourteen words. These are of course the first fourteen words of the New Testament. The first fourteen words of the NIV New Testament can also be read as THE SECOND COMING, as illustrated here. The opening verse of Matthew is also concerned with the genealogy of Jesus Christ, So the number 14 appears to have been part of the encoding in conscious reflection of Matthew’s account of Jesus’ genealogy, just as the number 6 and its multiples 12 and 18 must have been encoded in Genesis 1 in conscious reflection of the six Creation days! Moreover, the Malachi encoding is simply the fourteen words preceeding the Matthew encoding. In Hebrew gematria, 14 is the numerical value of the word 'David' (dalet, Vav, dalet). Here we see Jesus' royal lineage as the 'son of David' being underlined both in the plain text and the cybertext! 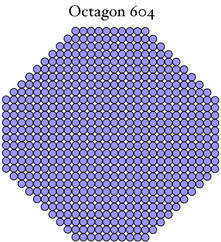 The number 604 is the 10th member of this sequence of octagonal numbers, more properly called truncated squares. The number 14 is implicit both in the construction of the sequence and in the construction of octagon 604. Firstly, the difference between each member of the sequence increases by 14 for each step, as shown in the table. The figure is also the truncated square of 28, or 14 x 2. We find our final bookend within the last words of the NIV Bible. Each encoded phrase covers nine words. Nine is the biblical number of endings, finality and judgment, which is perfectly appropriate for the book of Revelation and indeed the last words of the Bible. The other encoded number, 18, is a reflection of the first encoding in Genesis, also covering eighteen words. The four bookends incorporate larger patterns. 1. The numbers of words used for the four encodings form a neat 18-14-14-18 pattern, which is obviously by design. These numbers sum to 64, the cube of 4. The cube is a symbol of perfection and is the central symbol of the Second Coming, from which further symbols have been created. 64 is also 8th square and the total for the Genesis and Revelation encodings is 36, the 8th triangle. The number eight is the Dominical number, the number of our Lord, whose Greek name sums to 888. 36 is also the 6th square, six being the number of man. The two individual encodings span eighteen words and 18 can be seen as 6 + 6 + 6. The back-to-back Malachi and Matthew encodings are each fourteen words, summing to 28, the 7th triangle. 28 and 14 are both divisible by 7. Seven itself represents spiritual perfection. These facts suggest that the numbers 18 and 14 and their doubles, 36 and 28, were chosen to suggest a particular geometric object, and two methods of construction. The first drawing is also an image of man enclosed by spiritual perfection. Two consecutive triangles always form a square, but this is the only square I can find where both triangles are also the perimeter of the square and the square it surrounds. The third representation, with the coloured sections having 14, 14, 18 and 18 units, shows each encoding as part of a symbolic figure representing the two testaments, also an opened Bible! The number 29 is the reduced value of 'Messiah', so 2902 also suggests the Second Coming of the Messiah. The first and last encodings, which bookend the entire Bible and have values of 906 and 788, sum to 1694. This is 11 x 154, or 14 x 121, or 22 x 77 and these factors make the same proclamation. As with the Signature of Christ and the Creation Snowflake, the bookend encodings stand or fall together. The evidence for meaning, pattern and structure given on this page shows that they stand firm, supporting each other by their coexistence, their unified message and by the structure inherent in their placement at the beginning and end of each testament. 1. As mentioned earlier, the word strings carrying the encodings make a 18-14-14-18 pattern, the numbers summing to totals with important geometric properties. 2. All four strings have 151 or 197 as highest prime factors, both factors related to divinity through gematria. 3. The number of words in each string is meaningfully related to the biblical passages within which each string is found, as well as integrating with other encodings, further evidence for a higher design. 4. The word strings proceed from the beginning of each testament or run to the end of each testament. Numerating a word string that begins from a fixed point, rather than a string that could begin anywhere in a passage gives a greatly reduced chance of randomly hitting any given numbers and therefore a greatly increased chance that these phenomena are the product of intelligent design, rather than random action . 5. When two ideas are put together, such as ‘Jesus’ and ‘Second Coming’ these are encoded as separate numbers. Single concepts requiring more than one word, such as ‘Second Coming’ or ‘the Lord’ are encoded as one number. This is perfectly logical and, again, suggestive of deliberate planning. 6. In both the first and last bookend encodings the subject of the encoding (Jesus/the Lord) comes before the event (Second Coming). This is logical and consistent. There would only be a 1-in-4 chance of this ordering occurring randomly. 7. The phenomenon of numbers encoded within the first or last few words of a book is a recurrent feature of the New Bible Code. For more examples see In the Beginning and The Gospel Triangles. This consistency of encoding method is another example of inherent order. 8. As with all the major encodings in the NIV Bible, the numbers are obtained through the ordinal value system and take on meaning through the standard value system, this two-stage method being the signature of the New Bible Code. Each encoding repeats the same message, individually and collectively proclaiming the Second Coming of Jesus Christ. But who is the messenger? As explained elsewhere, a purely human origin for the code is unlikely, therefore the nature and origin of the intelligence that created the New Bible Code is profoundly mysterious. The message itself, however, is perfectly clear and perfectly in keeping with the larger message of the New Bible Code, as detailed in this website. 1. This is an alternative reading to that given in The Signature of Christ, where the number 391 is understood to be the second numerical signature of Christ, because 391 is the standard value of the Hebrew word for Jesus (Yehoshua). However, this alternative reading is just as valid, because the word ‘Jesus’ and the phrase ‘Second Coming’ are also meaningfully related. 2. This object should not be confused with a regular octagon, which has its own numerical series. 3. Once again this is an alternative reading to that given in In The Beginning, where the number 391 is understood to be a numerical signature of Jesus. However, for the same reasons as before, I believe this alternative reading is just as valid. 4. Both factors are prime too, and are the highest prime factors of the encoded numbers. The other factors are always 6 and 4. 5. To understand this fact, imagine creating strings of ten words from a sentence of twenty words. These would be words 1 to 10, 2 to 11, 3 to 12, and so on up to words 11 to 20. Eleven such strings could be created, multiplying by 11 the chances of randomly hitting a particular number, compared to the practice of only numerating the first (or last) ten words.